Tonight, the NASCAR Xfinity Series will run 150 laps around Auto Club Speedway. Ahead of the event, they’re going to set the grid. View the NASCAR Xfinity Series starting lineup below. Dylan Lupton looped it, smacked the wall and brought out the red flag in round 1. He’ll got to a backup race car for the race. Toward the end of the session, the track is slick. The rear ends are slipping as the track bakes in the California sun. Joey Logano is quickest in round 1. Single car runs in round 2. The short track racer, Ryan Preece just turned a significantly faster lap time in round 2 than he did in round 1. He might have been saving the tires in the first round. Or, he just learned something between rounds. Elliott Sadler was tracking .3 tenths in the green. He lost it all at the exit of the corner. Sadler runs 4th of the five drivers who have turned a lap. Preece remains at the top of the board. John Hunter Nemechek leads late in round 2. However, Christopher Bell is on a flying lap. Bell to the top of the board with just one car remaining. Just short, Logano runs 2nd. 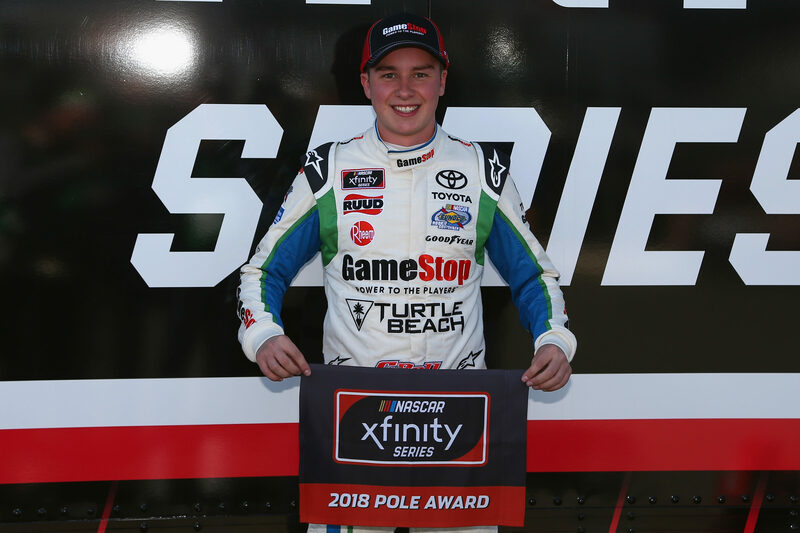 Christopher Bell takes the pole for tonights event in Fontana, California.